Add to My Favorite Store. 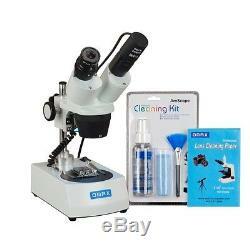 OMAX 20X-40X Binocular Stereo Microscope with Dual LED Lights plus USB Digital Camera and Cleaning Pack. This is a package of cordless stereo binocular LED microscope with an USB digital imaging system. It can be used on 110V power supplies as well as running with 3 AA batteries, which means that it can be used in the outdoor fields. The microscopy has 20X and 40X two step magnifications with dual LED lights from both top and bottom sides. The USB digital imaging system captures still microscope images and live video on computer. The included software compatible with Windows can also be used to make measurements. You can also view and capture the images on iMac or Macbook with Mac OS. The stereo microscope has large working distance of 57mm and maximum field of view of 10mm. This microscope is a good choice for people who like to collect coins, stamps, rocks, gemstones but with low budget. It is also a good choice for students who would like to inspect insects, botanical specimens and etc. The package also contains a cleaning pack, which consists of a 100 sheet lens cleaning paper booklet, and a 3 piece cleaning kit. 640x480 USB digital camera with 0.45X reduction lens & software. 45°inclined binocular head with locked-in eyepieces. Dual (upper and lower) LED cold lights. Running on power outlet or 3 AA batteries. Head vertical moving range (along the pillar): 2-3/4 (70mm). Focusing adjustment range: 1-5/8 (42mm). Power supply: Power adapter: 120V AC Battery: 3 AA batteries. Digital camera: - true color 640 x 480 pixels - 0.45X reduction lens to get larger field of view - Software compatible with Windows and Mac OS (see below for version information) - Capturing microscope images, recording live video, measuring lengths, angles, areas, editing image s. Cleaning Pack: - 100 4"x6" cotton lens cleaning sheets - Brush length: 5-1/2" (13.5cm) - 100ml of cleaning solution - Cleaning cloth size: 5-7/8" x 6-3/4 (15 x 17cm). Dimension: 8-1/4"x 4-3/4" x 14-1/4 (21cm x 12cm x 36cm). Please check the chart below for computer operating system compatibility. USB camera with 0.45X reduction lens. CD (camera driver, software and user's instruction). 30.5mm eyetube conversion adapter. Cleaning Pack - One booklet of 100 lens cleaning sheets - One cleaning cloth - One bottle of non-aerosol cleaning solvent - One brush. The item "OMAX 20X-40X Cordless Dual LED Binocular Stereo Microscope+USB Camera+Clean Pack" is in sale since Wednesday, April 01, 2015. This item is in the category "Toys & Hobbies\Educational\Science & Nature\Insects & Bug Habitats".